Welcome to Amai Maid Cafe AnimeCTX’s premier maid experience! We will be hosting hour events where you can join our maids for tea, snacks, and some great performances. Be sure to buy your passes ahead of time! 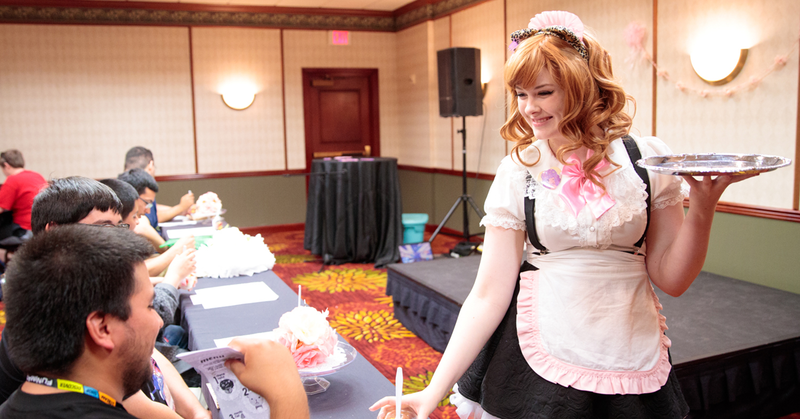 Welcome to Amai Maid Cafe, AnimeCTX’s premier maid experience! Join our maids as they bring you live entertainment with song, and dance! This the closest you can get to being in Japan without a plane ticket! Wouldn’t it be great if the characters of “Miss Kobayashi’s Dragon Maid” were actually at a maid cafe? Well, now they are! Join Tohru during this slot for maid dragon themed misadventures. A SPECIAL GUEST will be in attendance during this already special occasion, the dragon maid herself Sarah Wiedenheft (the voice of Tohru)! Do you like cute cat girls as much as you like cute maids? Well, meow you can have both! Come visit us during Neko-Neko hour for a cute overload as our maids don cat ears and tails– paw-sitively adorable! Love board games? Come join us for our GAME NIGHT hour to play Apple to Apples, Words with Friends, Tumbling Towers and so much more! Come join our staff for a relaxed hour hanging out and playing games together! We’ll be playing a variety of games that may or may not be appropriate for younger folks, so this hour will be 18+. ~take videos or photos of our staff at any time. Every visit includes a beverage, a fruit cup, one sweet snack, and one noodle bowl. Pick your favorite maid or butler to take a cute instant photo with you!